I returned last night, feeling a bit sick after the very long day (flight plus trip back from Heathrow landed me at home at 2:30 am China time after having been up since 6 am China time). The trip was amazing and I don’t really know where to begin. I have over 1500 digital photographs to sort through, not to mention souvenirs, laundry, and oh yes a full-time job to return to. There are so many stories I could fill pages and pages, but I’m going to skip the blow-by-blow travelogue and try and report a few snippets in the form of scenes that captured for me the essence of my China experience. The scene: The back of a Beijing taxi-cab. My sister and I had just left our hotel for the night (sleeper) train from Beijing to Nanjing. The cab driver spoke no English, but my sister was chatting with him in Chinese. He seemed to like her, given the views I had of his crinkled up smiling eyes in the rearview mirror. (NB this was about a 50-50 crapshoot with cab drivers, some seemed happy to have us in their vehicles and chatted with my sister in Chinese in a very friendly fashion, and some seemed very resentful–perhaps at us being foreigners? Hard to tell.) After some small talk he asked if we minded if he put some music on. My sister said “no, of course not” and some Italian opera started to play. The cab driver sang along a bit, and asked my sister why she was not singing and she responded that she didn’t know the words. The song ended and “Unchained Melody” came on. Bingo. This one we could do, and we started to sing along, timidly at first but growing in volume as we heard the driver singing along too. At one point, we were stopped at a red light and my sister and I looked over into the cab sitting at the light next to us, and we were being stared at by the driver and passengers alike. Music, the universal language, had brought together three people with no single common spoken language, and we were all animatedly singing at the top of our lungs. I could not look at my sister or I would have busted out laughing. I will also never be able to hear that song again with a straight face. The song ended and the three of us–my sister, me and the Chinese cab driver–burst into a round of spontaneous applause. He turned to my sister and said “Our time together is too short, we are nearly at the station.” We arrived at the station all singing Celine Dion’s “My Heart will Go On” from Titanic. I cannot get this out of my head, and I fully blame Kat (she sent me the link yesterday). What a commentary on America by a Brit (she’s Welsh, for the record)! No, that sound you heard this evening was not actually the wail of cats being repeatedly tortured for a prolonged period of time. That was me, trying to see if I could re-discover one of my hobbies. Long-time readers of this blog will know that, aside from being a science-y type, I have long had musical aspirations on the side. This started with piano lessons, ages 5-17. There was a hiatus, ages 17-25, and then I decided to take up the violin. Half on a challenge (someone told me once that as a piano player I was not suited to do it). Half on a desire stemming from having played keys with a string orchestra in high school. Took violin lessons for four years ages 25-29, but then when I finished my PhD things slowed down again. Darned jobs and all that. I managed a year and a half of singing in a semi-pro choir when I came to England ages 31-32.5 before my job got too busy for three nights a week, and in that time recorded two “real” classical-choral CDs, which was fun. (Note to commenters who asked about my CDs on a previous post–email me and I can send you details! I believe those who asked all know my email or if not drop a comment and I’ll send you the links.) It was sort of an opportunistic thing. I sang in a choir in high school, and did musical theater, but mostly because I also played the piano for the choir and did piano accompaniment for theater stuff. I never really wanted to sing the way I wanted to play the piano, or later, the way I wanted to learn to play the violin. But then, last week, jet-lagged and fresh off the plane from America, back all of ~20 hours, I got a mass email looking for amateurs for an orchestra. And I started drooling. Because I took up the violin in graduate school, I did not have the history with the instrument that most people, who take it up in primary school, have. I have played songs by myself and duets with my teachers. I have never played in an orchestra. And man, do I want to! Problem number one then arose immediately. My original violin is in my parents’ basement in Minnesota. I’m here. My second (!) 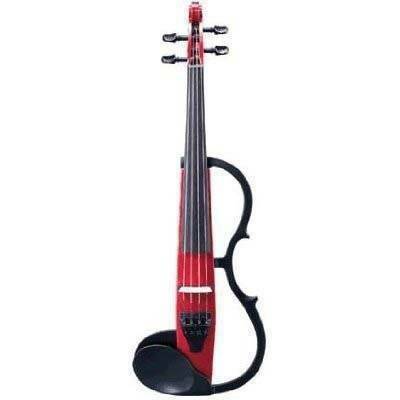 violin is here, but it’s electric! There are two reasons for my having moved the electric violin to England and having left the ‘analog’ version at home. One, I live in a one-bedroom flat in a densely populated town (this is England, is there any other kind?) The “silent” violin is brilliant and much less of a guilty thing for me to play in such circumstances–what noise they hear is nothing compared to the richness of what I hear through the headphones. Two, and most peculiarly, the thing was always more comfortable for me to play compared with my “real” instrument, which I had first and for several years before I got the Yamaha. It has an integrated shoulder rest, and I even tried to buy the same brand of shoulder rest for my “real” instrument and it still did not feel as good. And my teachers hated the bow that came with my “student violin kit” and loved the bow that came with the Yamaha. (Geeky engineer in me says: Go Carbon Fibre Technology!) And let me note that mine was NOT a cheap student violin, the thing cost me a fortune and was paid for in installments when I was in grad school doing my PhD, at a time when I did not have lots of money but was still splashing out for the instrument and for lessons. ANYWAYS, I digress. I moved, I brought the electric violin with me. I played it occasionally in the first few months that I was here, but then joined the choir and got really busy. Used my digital piano a fair bit during that time to learn my alto parts, since I was a bit rusty at the singing thing, having not done much of it since high school. The electric violin had not been getting much use until today, when I had the chance to go to the orchestra’s first rehearsal to try and decide if there was any chance that I could join in. I got the instrument tuned up this afternoon in the most geeky manner possible (fitting, of course) using a tuning app that I have on my iPhone. (I bought the app on the recommendation of a fellow violin player at work, even though I had not been doing any violin playing. But hey, today I needed it and was so glad that I had bought it!) I played around with the violin, went to the first hour of the orchestra rehearsal, and then came back and tortured my poor neighbors with said violin for another 45 minutes. It’s really not actually “silent” although it’s much quieter than my student violin kit ever was. The verdict: perhaps unsurprisingly, given the fact that it’s been 4.5 years since I was in lessons, my violin playing is rusty. Really rusty. Cat torture rusty. I am lacking the callouses on my fingers and the strength in my arms that I had developed when playing the thing most days. I also have to be realistic about the fact that, since I took the instrument up as an adult, I will never have the natural feel for it that a kid who started Suzuki method classes at age 3 would have. I am also realistic about the fact that I have never been the most gifted musician ever, I have been more in the mold of “hard work, practice, practice, practice” (much to the chagrin of my very gifted, plays the piano by ear, father). BUT, all of that said, I had a fun time playing the violin today, and I think I might have to do that more often. So apologies to my neighbors, the tortured cat noises are likely to continue. I may not be sufficiently gifted or practiced to join up with the orchestra now, but I’m unlikely to stop trying, and planning for next year. I may try and find a teacher here, and acquire another “real” student violin kit (and sell the one sitting in my parents’ basement gathering even more dust than my electric had been gathering in my flat here). I got a new music stand today, and it’s set up in my living room, next to the nicely tuned electric instrument in its case (until tomorrow, when I’ll have another go at the books I was playing from in my first year as a student of the instrument–that’s how far back I had to go today!) It’s just too nice to have something interesting to do at the end of a long, boring technical day spent in front of a computer, and dealing with the endless administration and paperwork associated with having a grown-up job. In 2000, I was married, living in a 3BR house that I owned with my husband. We had a dog, a car and an SUV (to help fill three car garage) and all the other trappings of a suburban existence (lawnmowers, snowblowers, etc. to also help fill the three car garage) . In 2010 I am divorced and living in a work-subsidized 1BR flat and I have neither pets nor vehicles. In 2000, the only foreign country I had visited was Canada. In 2010, I live in Europe and have travelled extensively in Europe, Asia and Australia. In 2000, I had a Master of Science degree and was a full time student. In 2010 I have a nearly 5-year old PhD and a full time job. In 2000, I had four living grandparents. In 2010, I have one but she’s a spunky nonagenarian. In 2000, I used dial up internet for email and web access at home. There was no Twitter, Facebook, or Blog in my life. In 2010, I mostly use wireless broadband to access social media and web 2.0 content, although sometimes I tweet or post a blog from my iPhone. In 2000, I was a PC. In 2010, I’m a Mac. In 2000, I was not a great cook and I sometimes made bread in a bread-machine from a just-add-water mix. In 2010, I am an improving and enthusiastic cook, and I make homemade bread on a whim many weeks, without having to take out a cookbook or actually measure much of anything. In 2000, I had never recorded a CD. In 2010, I have two professional recordings on my CV, although I’m no longer finding myself with the time to do music at that level (but I hope to get back to doing at least something musical sometime soon). In 2000, I only had a point and shoot camera. In 2010, I have both analog and digital SLRs but neither has been getting much use lately (darned job again!). In 2000, I wore size (American) 6 jeans. In 2010, I don’t. In 2000, I had never been to Texas. In 2010, that is still true, but I’m heading there tomorrow! in 2000, I had never tasted single malt Scotch. In 2010, I rang in the New Year with a wee dram of Balvenie Double Wood, my current favorite. In 2000, I owned a CD player and a VCR. In 2010, I play music over the Bose speakers on my iMac when home, and over an iPod with noise canceling headphones when on the road. Movies are DVDs or downloads/streaming over the internet. In 2000, I did not know most of the people who are likely to read and comment on this little reflection. In 2010, I’m a very lucky expat blogger! So admittedly many of these changes have been in more than just my world: technology has moved on, society has moved on, the world is a different place after a decade. But it does sure make me aware of how little I can predict about where I’ll be, what I’ll be doing, and what life will look like more generally in another decade! Best wishes to everyone for the new year, and feel free to leave your own “In 2000 I … but in 2010 I …” in the comments! I’d love to know what big changes others have found in their lives over this first decade of the new millennium! Over the weekend, my dear sis went to a concert for the band ‘Sodagreen’ in Shanghai and apparently managed to attract more than just a bit of attention. Now two things are true. I have never been as creative as my sis, and I absolutely adore that she was wandering around Shanghai in this wig. And using it as part of a greater plan to be the lead singer of Sodagreen for Halloween. Second thing, I still don’t have a costume for Hallowe’en and I need help, being not as creative as my sis I’m a bit baffled at the moment.